We are more used to seeing rust on our first car than our lawn! Infected turf appears generally yellow/orange. Close examination reveals the leaves with orange fungal pustules which, when touched, disperse large numbers of uredospores. These are very similar in appearance to the rust dust, which can be wiped from rusty metal, hence the name. When is it normally seen on lawns? During cool weather in summer and autumn. 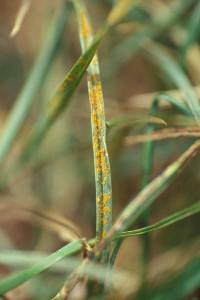 Initial symptoms show as yellow flecks on the leaves and plant stems. These flecks enlarge and the fungal spores develop on the leaf surface. Will it kill the lawn, left untreated? Rust Disease tends to be present on Rye Grasses and Smooth Stalked Meadow Grass. Rust disease is normally seen on long grass and poorly under nourished turf, especially when the air temperature is above 20 degrees centigrade. Grasses that are stressed as a result of poor nutrient levels, shade, and lack of moisture and presence of other turf grass diseases such as Fusarium and Red Thread Diseases. What are my options on control of the disease? The best remedy is to reduce the causes of the stress the grasses are under and to increase the nutrient levels. A slow release balanced fertiliser containing some Potassium will enable the grass plants to naturally ‘toughen up’ to ward off future disease and pest attacks. You may need to have a professional quality turf fungicide applied, which will have a contact and systemic mode of action. A repeat may be required within a 6-week period. The fungicide will dry the fungal spores out and then help the grass fight the disease from within. It is normally seen on grasses when you get to that evening in late September when you feel the dew falling on your shoulders and mutter to yourself ‘Looks like Autumn is arriving’. Football Pitches, which are predominately 100% Rye Grasses often get an attack along with Leaf Spot Disease when the evening and night time temperatures dramatically dip at the end of the Summer. They will spend a lot of their financial budget applying fungicide treatments to ward off future attacks and increase Potassium levels too. I have patches of fungi coming up through lawn(no stems).you can feel them hard lumps coming thru grass. They are clusters of hard light brown mushroom type and are spreading. Reply - that shows that you have a healthy soil. September is Mushroom season. Reply: Mow your lawn as it like long grass and fertilise as it is a disease of long grass and poor or low nutrition. It appears on turf grasses when the night time temperature dip heading into autumn. We planted new grass this year and gave rust pretty bad. Should I pick up the clippings after I mow or does it matter? Reply: Fertilise it now and make sure you mow it weekly. It's a disease of longer grass mostly and a few other factors like nutrition. 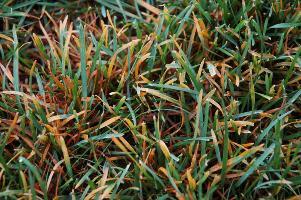 Reply - Rust Disease is mostly an autumn disease on undernourished lawns and it appears when the summer night time temperatures drop. It is rarely seen on regularily mown turf. A fungicide may help. My new grass has developed brown patches, and lifting a turf the roots are seen to move more in a horizontal direction rather than dowards to the soil.